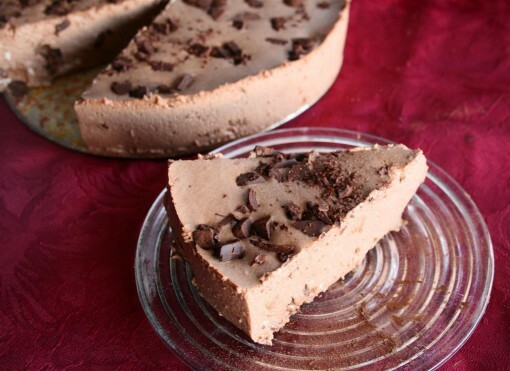 No Bake Chocolate Cheesecake was posted on February 7th, 2012 and is filed under Desserts, Protein, Recipes. This entry has 25 comments. You can follow any responses through the RSS 2.0 Comment Feed. I’m wearing pink today. Yesterday I wore red. There’s something about Valentine’s that I really love. I think it has something to do with one of my favourite family traditions. At Valentine’s Day dinner, we give each other chocolate and special notes that tell how much we care about one another. It’s always so meaningful. Okay, I admit it…I’m also kind of obsessed about the ridiculous amount of chocolate involved. I’m crazy about both of those…but I have to say I’ve found a new favourite! 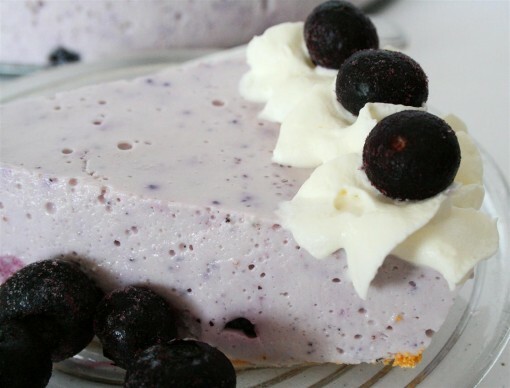 Delicious, creamy, low calorie, healthy, protein packed, and once again…without any cream cheese! Everything is better in chocolate! 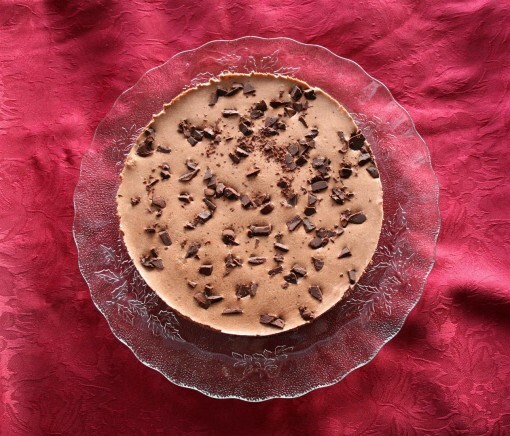 This would be a perfect dessert for your Valentine’s dinner! Serves 12. Mix the gelatin, sugar, stevia in the raw, and the salt together in a saucepan. Add the almond milk and 2 egg yolks. Put on low heat until the gelatine is dissolved and the mixture thickens. Add the chocolate chips and the cocoa. Take off heat and let cool a bit. Add the vanilla. Put the cottage cheese in blender and add chocolate mixture. Blend till smooth. In another bowl, beat the 2 egg whites. Fold in the rest of the mixture. Fold in the whipped cream. Fold in the chocolate chips/bits. Pour the mixture into the pan and chill overnight. If you want more chocolate goodness, drizzle some of this healthy chocolate sauce on each slice in a zig-zag pattern! Note: Nutritional info will vary depending on what kind cottage cheese you use or what sort of chocolate you pick…but it should be close. 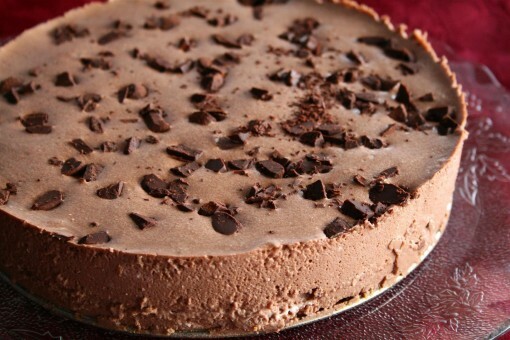 We actually used chopped up dark truffles instead of chocolate chips…this made it extra decadent! Just a heads up…sorry I didn’t get my next workout last week. I’ll try to have one up soon! Life has been extra crazy now…with studying and a new online venture I’m on (I’ll tell you about it soon!). What are you doing for Valentine’s Day? Do you wear red/pink on Valentines? This looks delicious! And I definitely need to go check out that blueberry one also. Ohhhh! I’m all about no baking. With all the cooking I do, a recipe that is easy is definitely up my alley. Love this and it looks SO creamy! Wow this looks so easy and so delicious!! :) Thanks for sharing! Aw! The tradition of giving chocolates and telling one another how much you care for each other is sooo sweet. I love that! 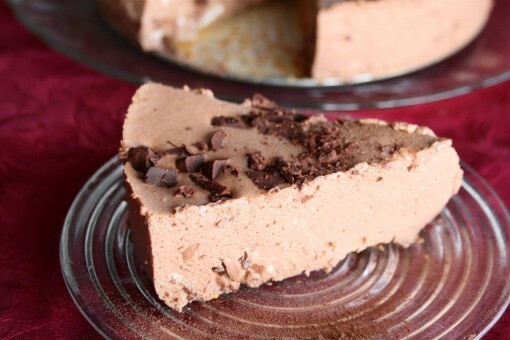 This chocolate cheesecake does look fantastic! I am sure a slice tastes even better than it looks-yum! I really do like finding time saving recipes that yield great results. Delicious post! Of course I wear red an/or pink on Valentine’s Day. I tend to dress for the holidays. I’ll wear green for St. Patrick’s Day, pastels for Easter, red/white/blue for patriotic holidays, orange or black for Halloween, brown and other fall-like colors for Thanksgiving, red and/or green around Christmas, etc. Oh my…this looks absolutely unbelievable! Love the texture and the photography that’s so clean! I really want to get better at food styling and you have definitely inspired me girl! Is there a way to make this without the almond milk? Lia- of course! Just use dairy milk or whatever other milk you enjoy! Is it possible to use regular cream cheese? Zoya – If you’d like to! Tell me how it turns out! 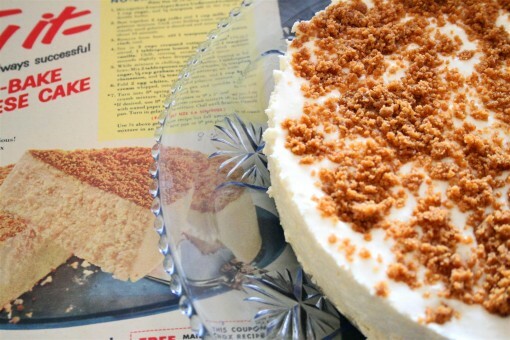 I’m looking to make this…when you say whipped cream, do you mean cool whip? or whip my own heavy cream? Cheryl – I avoid cool whip as it’s a bad trans fat, however, you can use that. In the recipe, I mean cream that’s been whipped. I live in a country where it is difficult to find traditional cottage cheese. Any ideas for a sub? Thanks!! Maria – I would start with a 1/2 cup of sugar and then just use a spoon to taste test to what you like. I like things a little less sweet, so you might find you want more! Hope that helps!